There’s pretty much no way I could care less about Booster Gold. A loser from the future steals a supersuit and a ring that lets him fly, kidnaps the robot that tried to stop him, and comes back in time to make money as a corporate sponsored superhero. I get that this is a neat idea, but no thanks. I’ve had my fill of unlikable “good guys” recently (I’m looking at you, Iron Man (and I m mean comic book Iron Man; movie Iron Man was made of all things awesome)). 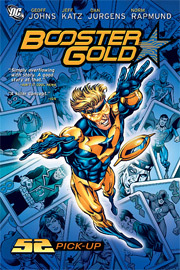 So when the new Booster Gold series started getting rave reviews, I took notice. When I thought about it, I remembered liking the Booster bits in 52, and since this new ongoing series spun out of that title I decided to give it a try. Simply put, Booster Gold: 52 Pick-Up was the most fun I’ve had reading comics this year. The premise: time traveler Rip Hunter (thankfully not his real name) has found several anomalies in the timestream. These anomalies occur around important events in history that effect the DC Universe in big ways, so Rip decides to do something about it. He recruits Booster Gold to help him, thanks to the instrumental role our hero played in saving the multiverse at the end of 52. There’s a catch however: if anyone (the bad guys causing these irregularities) found out Booster was helping Rip, they’d kill Booster in his crib. Rip avoids that fate by never telling anyone his real name and going by his ridiculously over the top pseudonym. So Booster, a man obsessed with being famous and thought well of, must sacrifice his heart’s desire for the greater good. Writers Geoff Johns and Jeff Katz wisely ignore all that crap that people hate about time travel, and instead focus on telling fun, meaningful stories. There is no talk of time paradoxes or the space/time continuum or anything that will make your head hurt. Instead, Booster meets up with a before-he-went-bad Sinestro, a hard-drinking Jonah Hex, and other heroes any fan of the DC Universe will recognize. There’s more to this volume, of course, but this isn’t a summary now, is it? The real gem of this collection is the story focusing on Booster’s repeated attempts to stop the Joker from crippling Barbara Gordon. Over and over again, our hero tries to stop this pivotal event in DC history, and over and over again he fails. It’s not every day that comic readers are lucky enough to witness the moment the characters we read about truly become heroes and earn the title of “superhero” so readily thrust upon them. After each attempt, an increasingly beaten up Booster demands to be sent back only to fail again. Each time he must witness the bullet ripping through the former Batgirl’s spine, and this only serves to strengthen his resolve. Only when Rip tells him that this moment can’t be changed, that Rip was sending him there to teach our hero a lesson, does Booster concede defeat. His way of conceding is to smack the pretentious, holier-than-thou jackass around a bit, of course, and it’s here where I think Booster is acting for us readers. God I’m starting to hate that guy. In a nice bit of continuity, Dan Jurgens, the man responsible for creating Booster Gold back in the 1980s, handles the art chores. I’ve gone back and forth on his art in the past, but his work shines in this collection. It’s perfectly suited to the stories being told, as evidenced by Jurgens’ ability to render just about anything Johns and Katz ask of him. From Wild West saloon to amorphous time streams, Jurgens handles himself with aplomb. The only negative aspect of this series I can think of is its heavy reliance of recent DC continuity. Someone who skipped 52 will have no idea what’s going on at times, and certainly won’t get some of the more subtle jokes. I’d love to recommend this book to Southpaw, for instance, but he’s been on sabbatical from comics for a few years and I can’t in good conscience tell him to drop $25 on a collection he won’t be able to fully enjoy. People like me, nerds/geeks who read too many comics, will love this book about a loser who becomes the greatest hero nobody’s ever heard of. Tags: Booster Gold, comics, Dan Jurgens, DC comics, Geoff Johns, Jeff Katz, nerds!, things that are awesome, who uses "aplomb" these days? This entry was posted on June 11, 2008 at 2:47 pm and is filed under Uncategorized. You can follow any responses to this entry through the RSS 2.0 feed. You can leave a response, or trackback from your own site.